As collectors get a hefty dose of nostalgia with 2013 Topps Archives Baseball, one basic insert set is proving particularly difficult to find. Thus far, the 2013 Topps Archives Baseball Retail Chase is proving to be just that. Available only in packs available at places like Walmart, Target and other retail outlets, the combination of exclusive distribution and long odds is ensuring that not many are showing up. And those that do are fetching some very solid prices -- even with such an unimaginative name. 2013 Topps Archives Baseball Retail Chase cards are inserted 1:136 packs. The cards take on the design of the 1989 Topps Baseball All-Star subset. The cards are bright, busy and tough to miss. With a 20-card checklist, finding individual players further adds to the set's difficulty. Early eBay sales of show a broad range of prices. 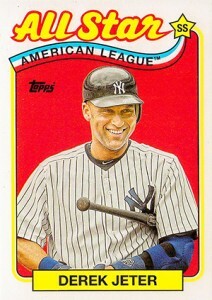 Multiple Derek Jeter cards have topped $40, not bad for a very basic insert card. 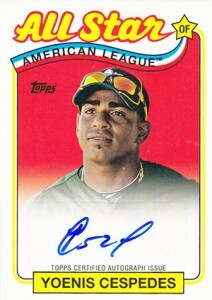 Ten of the cards also have autographed versions that are even rarer. Each is numbered to 10. Cards are not signed on-card. Rather they use stickers. While the number of 2013 Topps Archives Baseball autographs sold on eBay during the first five days of release approaches 1,000, the number of Retail Chase inserts that have switched hands on the site is less than 20. I LOVE these inserts. I wish they were a little less tough, but they are really great looking. 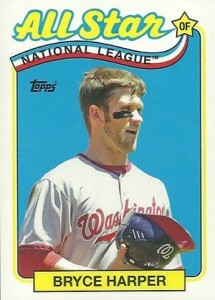 I really like what Topps is doing here by reducing the print run of the basic insert and moving to 1-per-case relics. Doing so increases the value of both and makes collecting more of a challenge without affecting the base set. I wish they would more widely adopt this strategy across their brands, but with some middle ground. 1:100+ packs for a basic insert is too rare to be collectible, but something like 1:20 for a set like this and you could really have a winner. GrandCards � I agree. Personally, I think we’ve become conditioned to the “hit.” Tiered inserts have a history of holding solid value. I think there’s room for ones with long odds, though the specific pack distribution here is what makes it even trickier.